There comes a moment in every successful revolution, uprising, or demonstration, when a hinge turns, a gesture is made, and the balance of power shifts, sometimes for a moment, sometimes forever. In 1968 Hugh Thompson orders his helicopter crew to fire on Lt.Calley’s troops if they continue killing Vietnamese civilians at MyLai. In 1979 a soldier in the Shah of Iran’s army shoots a security officer who is beating an anti-Shah demonstrator. In Tunisia, an army patrol forces the security forces to stop harassing the funeral procession for a young man security squads had murdered the previous day. In Egypt, a convoy of tanks sent to secure a bridge fraternize with the demonstrators who climb on top and urge the soldiers to turn against the police. In 1968 I witnessed such a moment, not on the scale of the above, but of the same kind, during Stop the Draft Week in Oakland, California. Ten thousand demonstrators had barricaded the streets around the Oakland Army Induction Center, confronting thousands of police This is an excerpt from my upcoming web novel LIBERATED ZONE. The facts are absolutely true, only the names have been changed to protect the guilty. Jimmy slipped through a hushed crowd at 12th and Washington. Cosmo, sanchopanzaing behind, bumped a demonstrator, said sorry. Girl in a peasant dress. Green eyes. Intense. He eased around her to the front line. 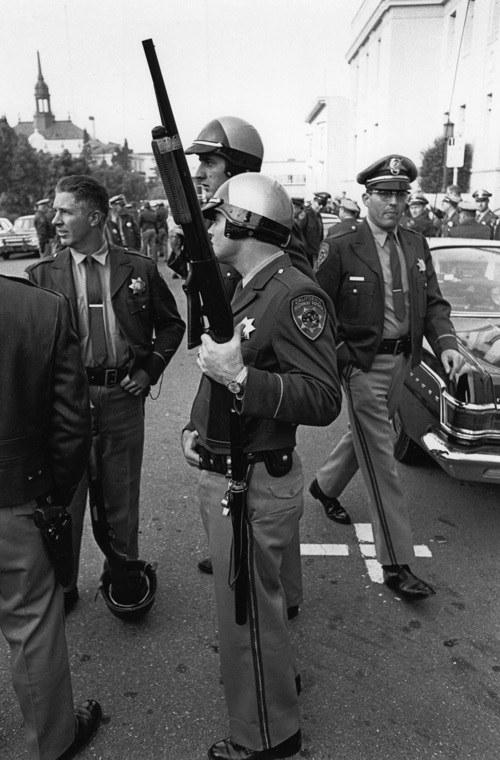 A six-deep legion of California Highway Patrolmen stood across Washington, the only barricade a lone man who paced before them, reviewing the troops, thought Jimmy, addressing the cops directly, and by reflection the demonstrators behind him who stood on benches, rested on tire-flattened cars, listened as if they were both cast and groundlings and had waked from the play to find what was at stake in this lecture to the armed was nothing less than each of them. 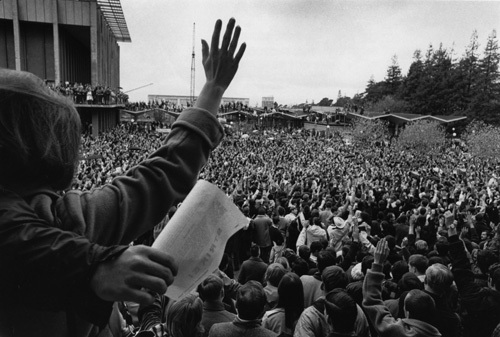 Wilhelm, Berkeley grad student leader. Jimmy did not dislike Wilhelm. He held him in remove, the campus radical with the Brechtian hair, John Lennon glasses, self-made European Intellectual born in Minneapolis. “Watch.” Shauna was at Jimmy’s side. He flinched at her voice, followed her eyes. The third patrolman from the left turned to one beside him, nodded. “They’re listening,” she said, touched his shoulder. Jimmy suffered a swoon of faintness, looked to her left for Hank, who was there, the right palm of one hand balanced on the tip of a lead pipe in his jeans pocket, gunslinger style. Jimmy nodded brotherly to Hank, stepped away from Shauna. Hank would be satisfied so long as Shauna was his and no longer Jimmy’s. Jimmy balanced himself for the next moves. “How long has he been doing this?” he asked Shauna, not looking at her. To hear her voice. “Did you join the CHP to beat up kids exercising their right not to fight a war?” Wilhelm called out. Two patrolmen in the front row raised their batons to ready position to beat up kids exercising their right not to fight a war. Three more steps. Jimmy faded back, ready to lead whatever people chose to do next. Hank pulled the length of pipe from his pocket, held it behind him. Shauna (warrior princess, utterly trustworthy, the starless Georgia night, the gothic jail, Jimmy’s gun in her purse) moved to Hank’s side. Beneath her silk blouse a willowy vale of cream, shuddup Jimmy. The two patrolmen with raised clubs noticed their colleagues in the forward line had not done the same. They looked to the officer in the center, who shook his head, a pitcher shaking off a signal. They lowered their batons. “The nightsticks,” called Hank, loudly for Jimmy to hear, softly not to taunt the patrolmen, whose batons remained undrawn, holstered at their waists. “Clear the area,” commanded the metal voice. The crowd parted as for an honor guard. The CHP moved into the intersection, clearing it de jure and de people, but not des barricades. A social contract of spontaneous relations had been improvised and honored. Thus far, it said. No further. A man walked backward into Jimmy. Wilhelm. Jimmy kissed him on his bald spot. “I love you Willum,” he said. Wilhelm wiped his faux European glasses.